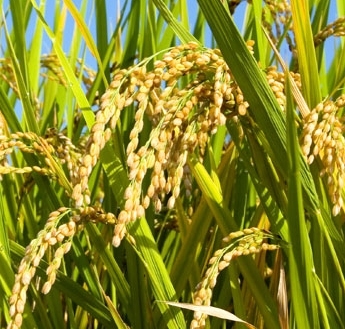 Some paddy is parboiled or converted by being soaked in water, then drained, steamed to gelatinize the starch, and dried again. Parboiling process involves the hydrothermal treatment of paddy before milling. To parboil a ton of paddy in a modern plant, the steam require at a pressure of 4 to 5 kg/cm2 is about 120 kg for soaking, 60 kg for steaming and 20 kg for losses, for a total of 200 kg of steam per ton of paddy. The advantage of the parboiling process stems from the gelatinization of rice starch and hardening of rice kernel that it brings about. This traditional process also may increase the nutritive value by distributing soluble B vitamins from the bran into the endosperm, and it may stabilize against insects and lipolytic rancidity, but it does not decrease consumer cooking time. Moisture content increases and is evenly spread throughout the grain. This is because of the extra water formed by condensation and because the temperature of both rice and water rise.